Please join us for today’s service led by Rev. Paul Dodenhoff. On November 4th, our Sikh sisters and brothers celebrated the 548th birthday of Guru Nanak, the founder of the Sikh tradition. Despite being the 5th largest religion in the world, Sikhism is largely a mystery to most non-Sikhs. 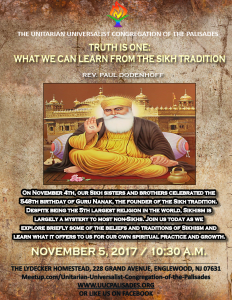 Join us today as we explore briefly some of the beliefs and traditions of Sikhism and learn what it offers to us for our own spiritual practice and growth.